There are some books that are timeless and never grow old.. And Then There Were None by Agatha Christie is one such book which though written some seventy years ago still has the power to shock the reader and leave him at a loss of words!! Ten ordinary people are invited, each by their supposed friends to spend a week on the famous and much discussed, Indian Island. Although these people seem ordinary, each has committed murder and got away with it!! Once on the island, they learn that their host is held back and wont be joining them. Cut off from the mainland, one by one they start dying all according to a nursery rhyme "Ten Little Indians".. In a race against time, they have to find the murderer (who it seems is one of them) and also get off from the Island before any more deaths occur.. This book was first published by the name "Ten Little Niggers" which was then changed to And Then There Were None because of the racist nature of the first title. It also has the distinction of being the best selling mystery ever. 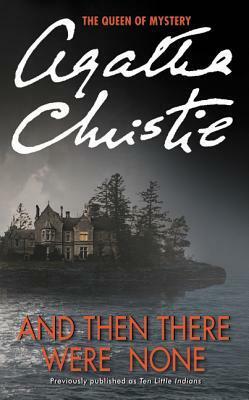 Definitely the best work of Christie and supposedly her favorite too, it has everything namely suspense,mystery,tragedy,drama, psychological reasoning, emotionally packed scenes and also some bone chilling and nail biting moments. Agatha Christie spins a tale that is unusual and definitely never heard of before. The treatment of the story and its ending is entirely new. Every tool is used to heighten the tension, terror and suspense in the story. Each character plays his/her part to perfection whether it be Rogers with "fright in his eyes, dry lips, twitching face" or Vera Claythorne, who was "frightened of the dark"!! The description of the house on Indian Island is exquisite and very admirably done using comparison as the tool to heighten the drama. The nursery rhyme, "Ten Little Indians" is expertly and very beautifully used in the book as a blueprint to the murders that happen. Its an ingenious plot that leaves the reader spell bound and speechless with no clue to what might happen next! "I don't know. I don't know at all. And that's what's frightening the life out of me. To have no idea...."
All through we are shown the reasoning of the murderer but still I couldn't make out his identity till the very end and then also I was shocked because as it says in the book, the murderer was totally unexpected. "Many homicidal lunatics are very quiet, unassuming people. Delightful fellows." A brilliantly designed and executed book with a plot that leaves its effect long after we have finished reading it. Its a once in a lifetime book. I have no words to explain everything that I am feeling after reading it but hope that my rating says it all. I give And Then There Were None a shining 5 on 5 and highly recommend that everyone read it. Books like this come once maybe in a century or more and are not to be missed at any cost.